I can’t believe Easter is almost upon us! I mean, seriously, where is this year going?! 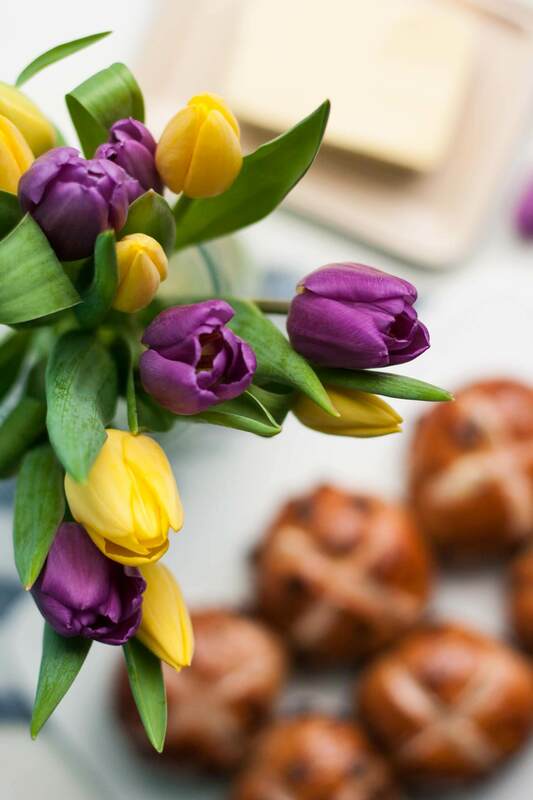 Not that I’m complaining, as Easter means hot cross buns and more specifically, this year, chocolate cherry hot cross buns. My relationship with hot cross buns wasn’t always a happy one. You see, I’m a strong believer that dried fruit has no real place in desserts. Ok, so there are exceptions: sticky toffee pudding – I have come to accept the presence of dates… And my mind has now gone blank, proving my point beautifully. If you dare to add dried fruit to my cookies, brownies, scones, flapjacks… well, just don’t do it, ok? I don’t know what it is exactly. Perhaps it’s because it can temptingly look so much like chocolate chips and then you take a bite and experience a surge of disappoint as you realise that you just bit into a… RAISIN. Eurgh. And so it is with hot cross buns. The idea of a piece of spiced bread stuffed full of raisins (and the dreaded mixed peel) was not an appealing one, for years. Until I tried a chocolate hot cross bun, still expecting to hate it because of the spice, yet finding that I not only liked it but I loved it? 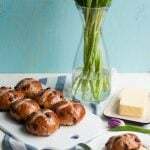 That was a turning point for me and it became my mission to make some awesome, raisin-free hot cross buns at home. I know that must sound very disappointing to all the traditionalists out there, but hey ho. Lots of disappointing hot cross buns have been made and it’s taken me 2+ years but oh my, I’ve done it. 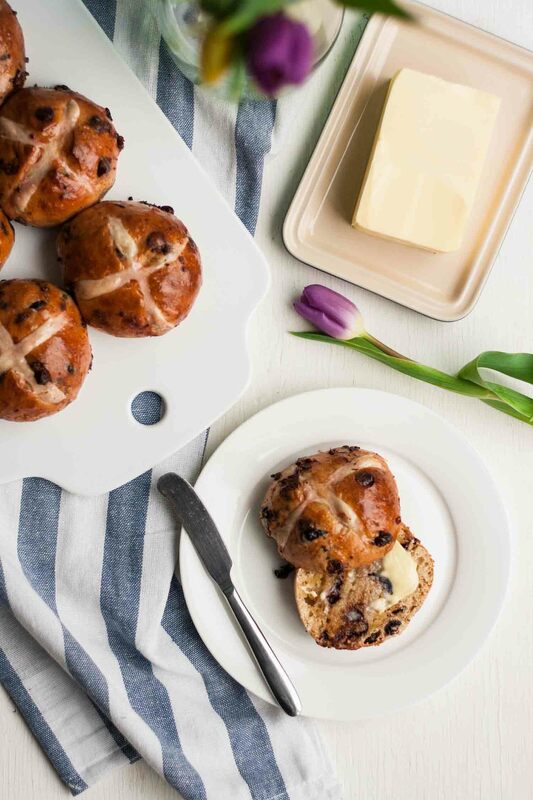 These hot cross buns are pillowy and soft and full of flavour and gooey chocolate if you eat them whilst they’re warm (which is mandatory). Spread with butter of course – salted, in our house, the sweet/salty contrast is irresistible – but unsalted is fantastic too. I’ve finally made an amazing hot cross bun at home. I got so excited when I pulled these out of the oven! Now, I know you’re probably looking at the title of this post and thinking ‘but isn’t there dried fruit in this recipe?’ and you would be right. Because the one, unfaltering exception to my no-fruit rule is the dried cherry. Cherries are a contender for my favourite fruit anyway, so it’s no surprise that I adore them in dried form too. I think it’s because they’re a little bit tangy and taste amazing alongside chocolate. They more than make up for the lack of raisins and mixed peel, no? And for somebody who used to be a spiced dessert hater, it’s funny because I really went for it on the spice front. 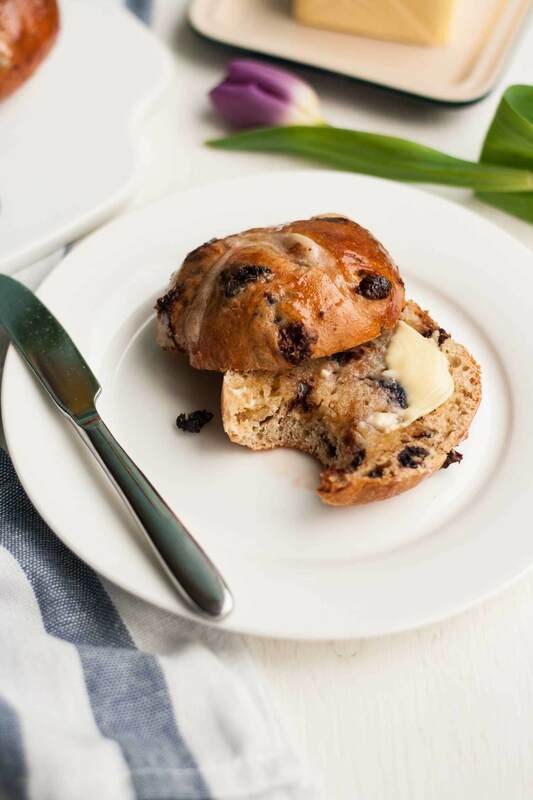 If you’re going to spice your hot cross buns, you might as well do it properly! The aromatic depth of these buns comes from infusing the milk as well as adding ground spices to the flour – a small extra step but oh so worth it! Oh and I know I said that I’d finished with the blood oranges, but as they were still around I managed to sneak them in again here. I’m so not sorry – the sweet pink juice gives a rosy glaze to the buns which I adore. And which tastes amazing, of course. 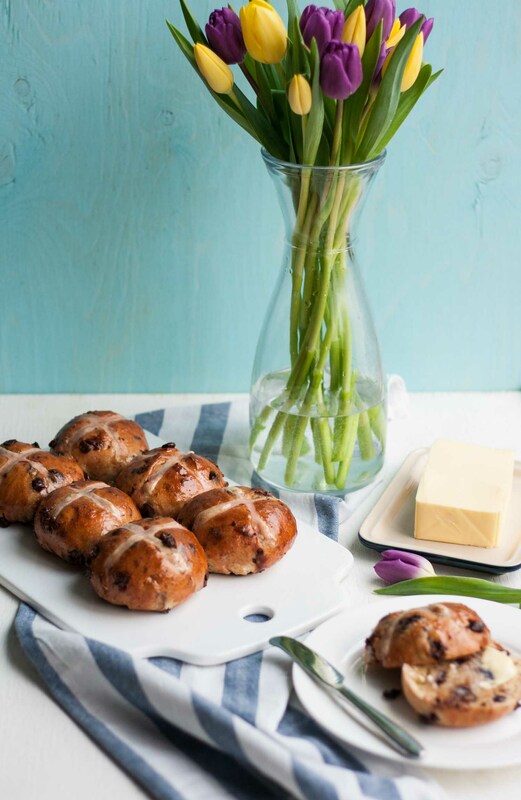 These are just the best hot cross buns ever so give them a try this Easter! Place the milk in a saucepan along with the butter, cardamom pods, cloves, vanilla paste and almond extract, if using. Heat gently until the butter has melted then remove from the heat and set aside to infuse whilst you prepare the other ingredients. In a large bowl (or the bowl of your stand mixer) place the flour, salt, sugar, yeast, orange zest, cinnamon, cardamom and nutmeg. Remove the whole spices from the warm (not hot) milk and add to the flour mixture along with the eggs and 60 ml (1/4 cup) of water. Mix until a rough dough forms, adding more water if needed (I added another tablespoon but you may need more, or less). Knead for 5-10 minutes until the dough is smooth and elastic. The dough should be soft and a little sticky. Place the dough in an oiled bowl and cover tightly with cling film. Leave to prove for an hour in a warm place, though it may need longer, until doubled in size. Whilst the dough is proving, halve the dried cherries and soak in the juice of half a blood orange. Once the dough has doubled in size, remove from the bowl and knock it back on a lightly floured surface (knead until all of the air has been knocked out). Drain the soaking liquid from the cherries. 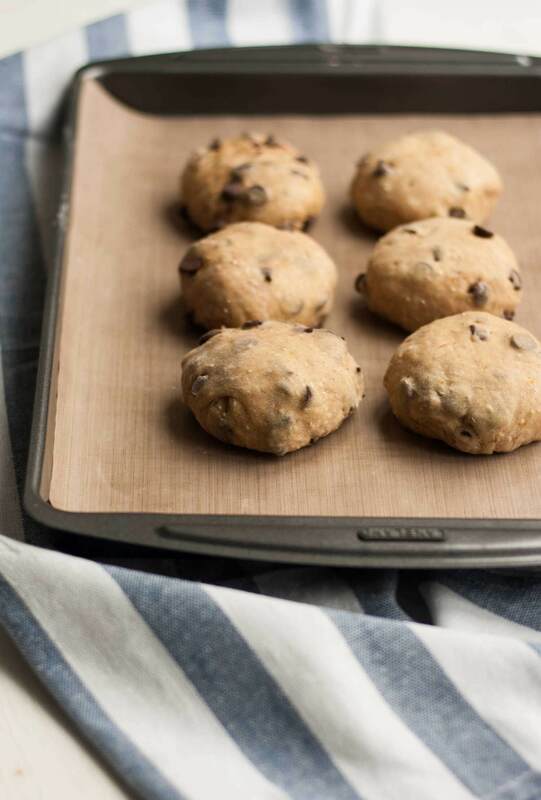 Sprinkle the chocolate chips and cherries onto the dough and thoroughly incorporate them by kneading and folding the dough. Leave to prove for another hour or so, until doubled in size again. Preheat the oven to 200ºC (400ºF). Knock back the dough for a final time and divide into 12 pieces. Shape each piece into a ball and place onto 2 baking sheets lined with a baking mat or parchment paper - 6 on each sheet. Place them quite snug together but not touching. Place each sheet into a large plastic bag (or use more cling film) and leave in a warm place to rise for one final time, until almost doubled and the dough springs back if touched gently. 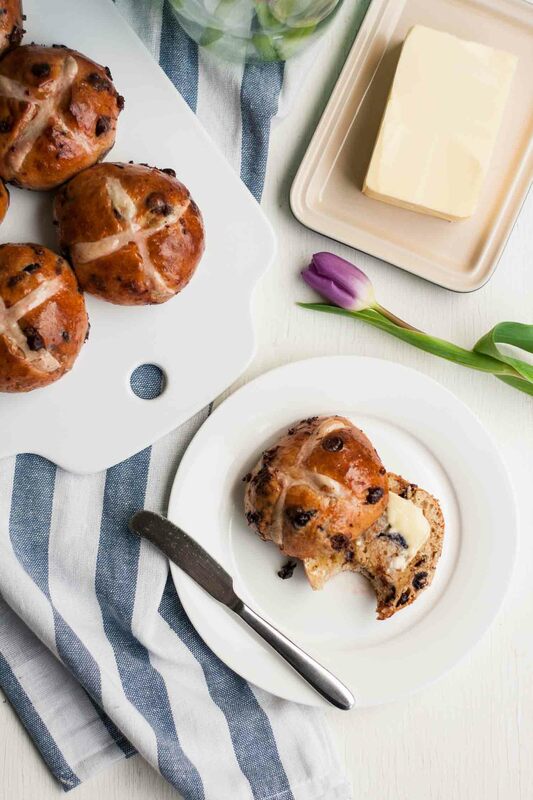 Gently score a cross into the top of each bun using a sharp knife. Mix together the flour and water for the crosses until smooth. Place into a piping bag or freezer bag with the corner snipped off and pipe crosses across the top of each bun. The flour/water mixture is sticky - confidence is the key to even crosses! Bake for 15-20 minutes until golden brown - keep an eye on them! Whilst the buns bake, place the juice of half a blood orange in a small saucepan along with the icing sugar and heat until the sugar is dissolved. Brush the tops of the buns with the glaze as soon as they come out of the oven. Wait a few minutes (if you can!) before splitting one open, spreading liberally with butter and eating joyfully! When I made these I found that they took a long time to prove, even when my house was warm. That's not to say that they would for you, an hour should be sufficient for the dough to double in bulk each time, but conditions vary and bread doughs are very temperamental! So that said, I'd recommend going for an overnight prove if you need these early in the day. A lot of recipes recommend proving in the fridge overnight but I personally haven't had any success with this route. If it were me, I would leave it out overnight in my (cool) kitchen, and then proceed in the morning. If I give it a go, I'll update the recipe accordingly! I use my stand mixer for this because it kneads dough far more effectively than I can - the dough should be fairly soft and a little sticky so you might prefer to use your hands. I have a fan oven and I turned it down to 180ºC (350ºF) about halfway through cooking. Gauge the cooking time/temperature based on how your oven tends to cook, just take care not to burn them! 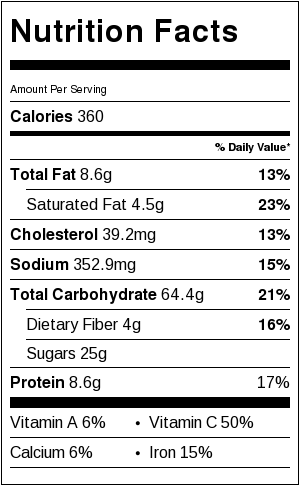 Nutrition label is for 1 hot cross bun. Recipe heavily adapted from Paul Hollywood.